David, Amy and Lucky the dog. 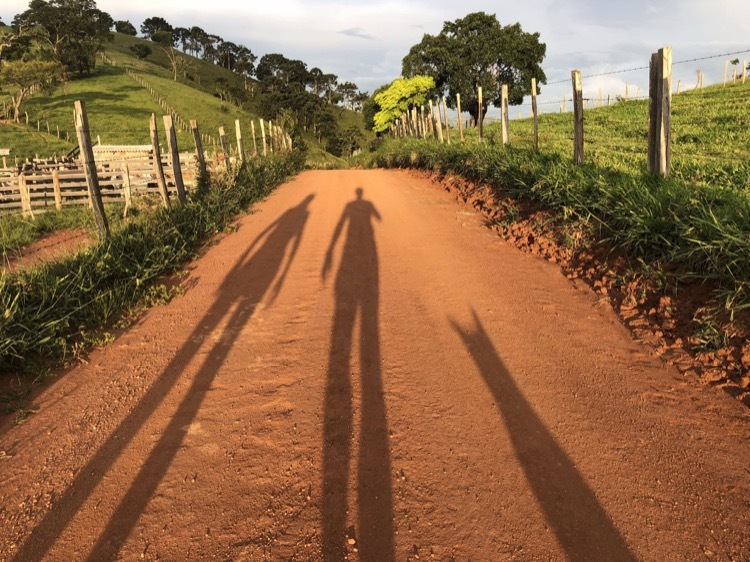 For his 54th birthday, ultramarathon veteran David Green aspired to traverse Brazil’s Caminho da Fe, or Path of Faith, but with a twist—he would coincide his journey to include the Brazil 135, race director Mario Lacerda’s incredibly challenging ultramarathon that covers 135 miles of the Caminho da Fe from São João da Boa Vista to Paraisopolis, with over 30,000 feet of cumulative ascent and over 28,000 feet of cumulative descent. It takes hikers an average of 12-15 days to cover the route of the Brazil 135 alone, whereas Lacerda’s race consists of a 60-hour cut off. 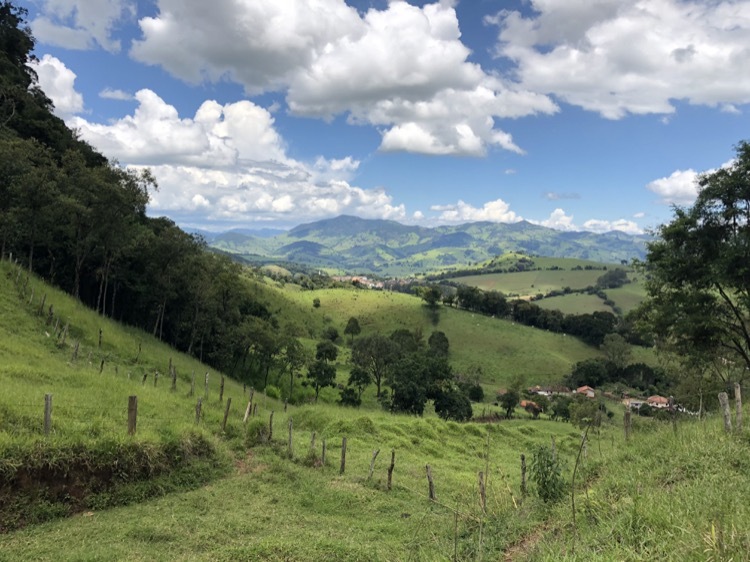 David’s total journey would consist of 361 miles of endless sugar cane and coffee plantations, not to mention challenging climbs up and down the Mantiqueira Mountains. The Caminho da Fe was envisioned and created in 2003 by Brazilian Almiro Grings after he twice walked the Camino de Santiago in Spain. Inspired by his experiences, Grings believed that Brazil, one of the largest Catholic countries in the world, should host a similar pilgrimage. He set about establishing a trail that covered 500k through São Paulo and the magnificent Minas Gerais states, utilizing back roads, some asphalt, waterfalls, forest, and trails within farms and railroad tracks, marking the trail with yellow arrows throughout. Roughly 300k of the journey is in the Mantiqueira Mountains, with its steep climbs and sharp descents. One of the newest Catholic pilgrimage trails in the world, it is said that some 30,000 pilgrims have traveled the Caminho da Fe by foot or bike to date, and that it typically takes travelers up to a few months to realize their journey, all the while stopping in a network of pousadas or inns on their expedition to Basilica of Aparecida, the holiest site in the world’s largest Catholic country and home of the Shrine of Our Lady of Aparecida. David’s aspirations to cover 361 miles were not unrealistic. The entrepreneur and founder of Splife has completed the Brazil 160 twice (Lacerda’s 160-mile race option on the Caminho da Fe), and the Brazil 135 three times. His plan became concrete when fellow ultramarathoner and Jacksonville friend Amy Costa committed to join him on the 361-mile trek. The Director of Eco Adventure at University of North Florida, Amy has completed the Brazil 135 three times, two of which were self-supported, and her most recent one amid her 361-mile adventure. It is worth noting that most participants attempt the Brazil 135 with the support of crew who are there for their runners throughout the race, intersecting with them every few miles, offering food, supplies, and overall physical and emotional support. To attempt and complete the race with no support, such as Amy successfully did twice, means that the runner needs to stop and buy food and water along the course, and take care of any issues that may come up on their own, such as blisters, sickness, getting lost. 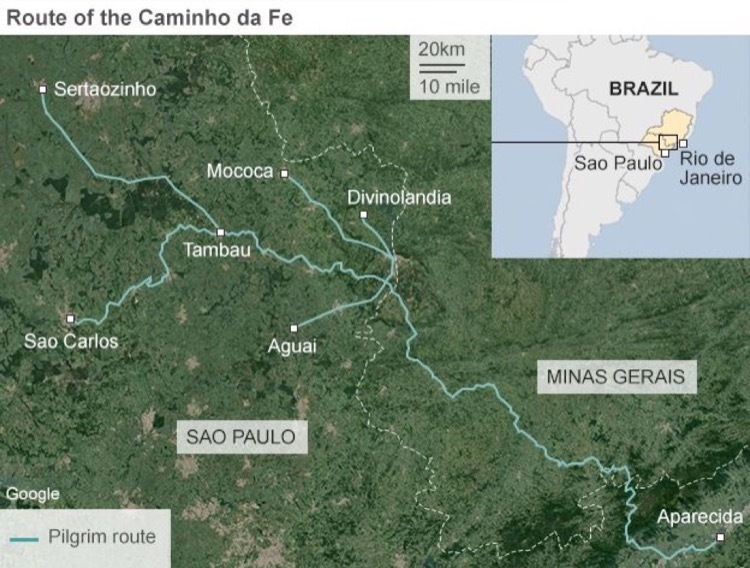 Amy was undoubtedly the ideal partner for the brutal Caminho da Fe trek. David and Amy commenced their journey at São Carlos, the start of the Caminho da Fe, with their goal of arriving at Aguas da Prata and covering 151 miles within three days, just in time to help at the Brazil 135 packet pick up, where they would meet up with friends and join in the fun and high energy of the Brazil 135 race. Their dedicated Caminho crew, Alan Lacerda, a firefighter and helicopter pilot from Rio de Janeiro, and Nivaldo Fabiane, a firefighter and first responder on the motorcycle unit from Rio de Janeiro, both Brazil 135 veterans, were to be with them every step of the way, helping them to navigate the course in its entirety. Their journey started off on a sun-filled day, with temperatures ranging from 73 to 95 degrees – a typical summer day in Brazil. Experienced endurance athletes, David and Amy committed to running the downhills and flats, and walking the uphills. Their first day set the cadence for the adventure: breakfast at their pousada or inn, a morning run session until 2 p.m, at which time they would break for lunch; then an afternoon run session lasting till roughly 6-8 p.m., followed by dinner and a few beers, after which they would run to their lodging for the night, arriving between 10 p.m. and 2 a.m., with crew and runners going to sleep for a few hours before it was time to start all over again. Along the way, David and Amy stopped in at churches and pousadas to stamp their Caminho da Fe passports so that they could achieve certificates of accomplishment once their mission was completed. At 10 a.m. on what was their fifth day on the Caminho da Fe (day four was an off day from running as they helped out at the Brazil 135 pre-race registration), David and Amy met up with Florida ultrarunning friends Bob Becker, a seasoned 72-year-old ultrarunner and the race director of the Keys 100, and Will Litwin, who were both attempting their first Brazil 135. Together, team Florida battled the Brazil 135 course until blisters and fatigue began to set in for David and Amy, and after some 65.2 more miles on the Caminho, which brought them to a total of 216 miles since their journey began, rest was mandatory. The Florida crew all opted to check into a pousada and turn off for the night. When they started off refreshed and ready to tackle the course the following morning, they encountered the stray dog that would alter the rest of the journey for David and Amy. 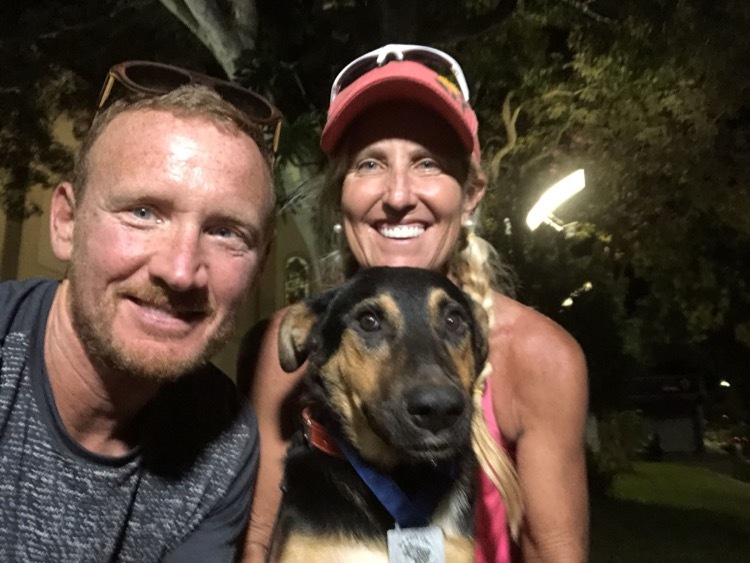 It wasn’t until after the stray dog joined their team that David and Amy learned from a race official that he had followed another runner out of the first town the Brazil 135 passes through at 11 miles in, Aguas de Prata. Now, 55 miles later, the stray was still eager to tag along. They didn’t know when the stray had left the other runner he had followed, or how he ended up in the same town as the Florida crew, but that morning, David and Amy’s sixth day into their journey, the dog was just the diversion they needed to make the miles a bit less tedious and painful. It’s worth noting that stay dogs line the Caminho da Fe, and are known to follow humans a few miles here and there, but with the heat and humidity of Brazil’s summer, most dogs can only make it a few miles before they are worn out and panting. There are also thousands of wild dogs that are territorial—that is, they attack dogs who are not in their pack. Although the stray had encounters with such packs as he escorted the Florida crew, he remained undaunted, and kept up with David and Amy, taking his job as their pacer seriously. Along the way, David and Amy noticed that the stray was keenly aware of the sounds of vehicles, and upon hearing them, he would move to the left of the road, stop and visually monitor each vehicle as it passed, at which time he would double-time back to them and fall in line behind David’s calf, following dutifully, not pushing them so much as making sure that the twosome kept moving. Twenty miles into the stray’s friendship with team Florida, crew member Alan added the stray dog to his list of responsibilities, feeding him scraps of salami and water. Some twenty miles later, when in need of rest, David and Amy separated from the other Floridians to check in to a pousada for the night, they had an issue. Crew and runners agreed that they couldn’t just leave the stray; he had become a part of their team after running with them for 45 miles. But the dog, who had likely never been indoors, would not cross the threshold into the pousada. That was when crew member and fireman Nivaldo picked him up and carried him into David’s room. Exhausted, David needed to sleep, only when he remembered that it was a wild dog that was in his room, he sprang into action. Gathering the little shampoo he had, he mustered the energy to put the dog in the shower to clean him up a bit. He wasn’t sure if he had fleas, ticks, or both, but if they were to be sharing close quarters, he wanted at least to rinse him off. The stray had clearly never been in a shower and cried as the water hit him. His hair came out in clumps as he had never been groomed. When the shower was complete, David dried him with a towel, and the dog fell into a deep sleep on the floor for the next few hours. 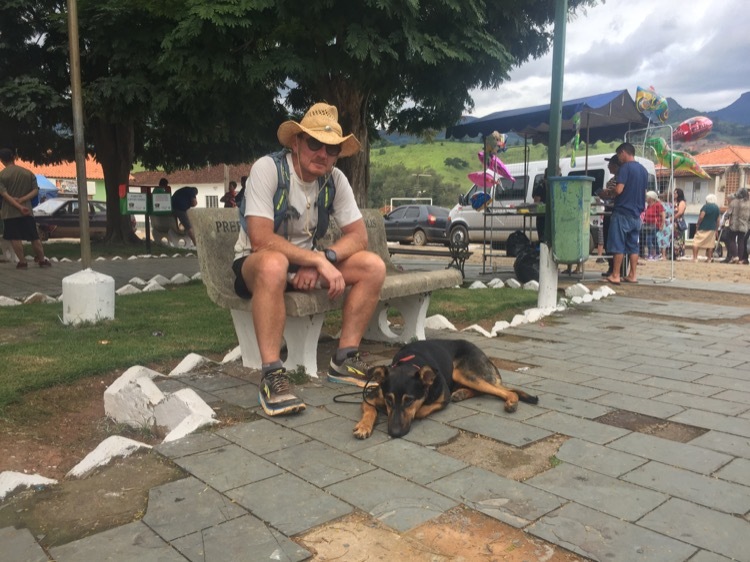 The following morning, before setting off to complete the Brazil 135 under the 60-hour time limit, David ventured to buy the dog a leash, collar, and some dog food, which with some luck, he managed to gather by visiting three different stores. 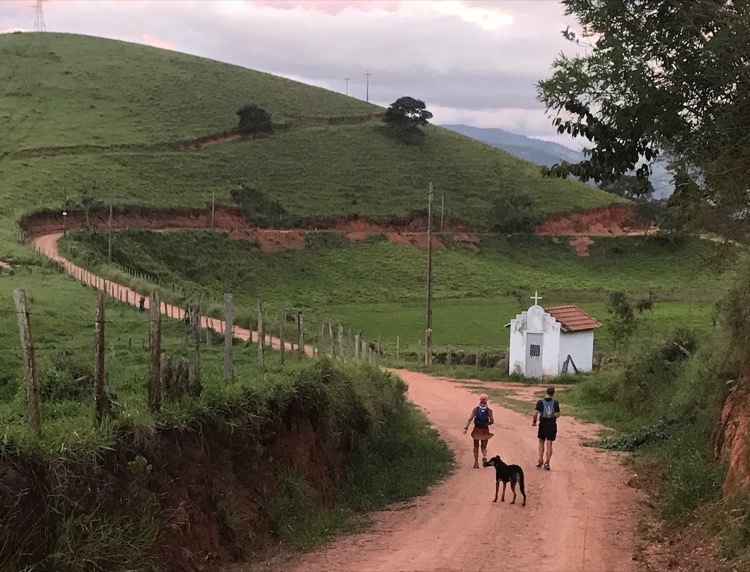 Hours later, blistered and fatigued, but with high spirits, David and Amy made their way into the town of Paraisopolis to the finish line of the Brazil 135, with the dog at their side. It was then that they named him Lucky Caminho, celebrating the stray who had touched their hearts with his devotion and persistence, following them along the trail, through the towns, and surviving the wild dogs en route, giving David and Amy strength and focus in some of the darkest miles of their journey. 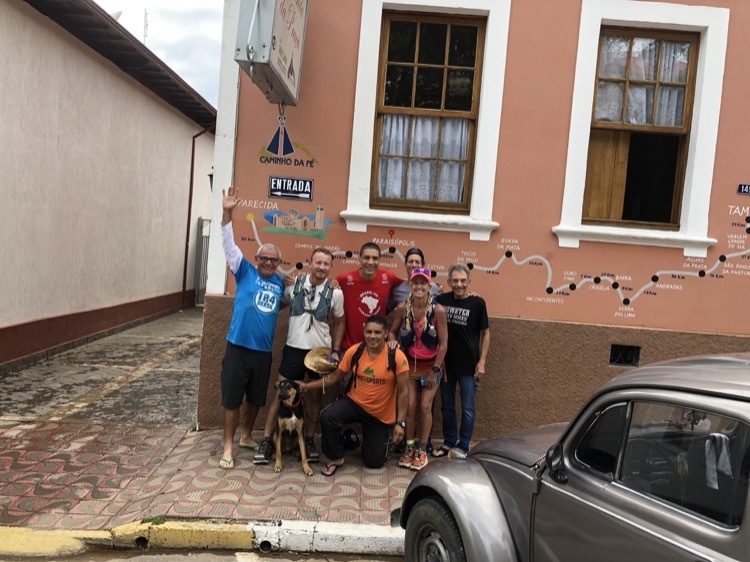 With two legs of their journey complete, after celebrating with friends for the night, and saying farewell to Mario, the other Floridians, and the Brazil 135 participants, David and Amy began to focus on the last chapter of their journey across the Caminho da Fe. They had less than 100 miles to go, but the next phase included the biggest mountain so far, known as “Leg Breaker,” as they made their way to the town of Campos do Jordao. They fell back into their rhythm of run and break to eat, and all the while, Lucky never strayed far from David and Amy. Wherever they went on the trail, Lucky was right by David’s side, but always looking back or forward for Amy. At corners, he waited to make sure both runners were moving along: under Lucky’s watch, no one was allowed to fall behind. When the runners rested, Lucky rested. As the miles wore on though, David began to grow unsettled—although Lucky was persistent, hearing his labored breathing as he slept at the foot of David’s bed the last few nights, he worried that the run may not be best for Lucky. He had never barked since he joined them, and typically followed with his tail between his legs, a blend of timid and hopeful, although he exuded pride in being with them, as if he was determined to get them to their destination. It was a few towns later, where the locals were on horseback on their way to church in the town of Luminosa, that Lucky got kicked by one of the horses and began to limp. It was with a heavy heart that David and Amy decided Lucky needed to rest. The crew loaded Lucky into the car, and Nivaldo, carrying the supplies David and Amy needed for their approaching monumental climb, joined them on the trail while Alan dog sat. 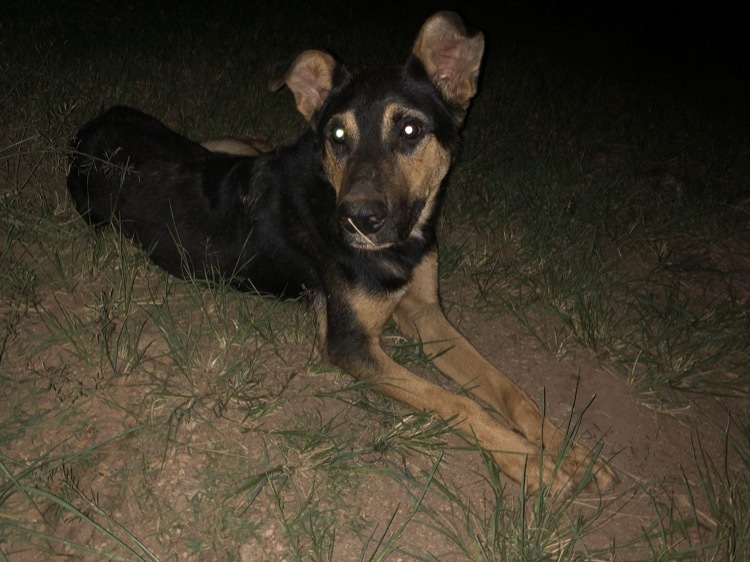 The next day, when the team arrived at the larger town of Campos, they made the decision to find a veterinarian to examine Lucky and assess his condition. David had decided along the way, with the blessing of his wife, Monica, back in Florida, that he was going to bring Lucky home to the United States if possible. The veterinarian, who crew Alan and Nivaldo found with the help of one of the inn keepers, had 18 years of experience. Hours later, David and Amy would learn from their crew that a blood test confirmed that Lucky had anemia, low hemoglobin, and a tick-born blood disease that affected his heart. The vet couldn’t comprehend how Lucky endured his journey so far – a total of 138.1 miles on the Caminho da Fe. A necessary rabies shot was out of the question for Lucky due to his failing health, but the vet put Lucky on an IV for the night and promised to call the crew with updates the next day. Alone on the trail now as the crew tended to Lucky, David and Amy focused on their task at hand: they were approaching their final destination with each mile. As they reached 6,500 feet into the mountains, the highest point on the trail, they knew it was literally downhill all the way to their ultimate destination of Aparecida. 351.1 miles behind them and 37,622 cumulative feet of elevation gained, with roughly ten miles to go until their journey was complete, they decided to rest at a pousada and hit the trail the following morning, which would be their tenth day since their journey on the Caminho da Fe commenced. There is something to the pause, to stopping and taking it all in, the grandness of the world and of the experiences that we pursue, that makes the final push that much more meaningful. The following day, when they reached the Basilica of Aparacida at the end of the Caminho da Fe—a trail that thousands of pilgrims travel each year over three months—both David and Amy felt something beyond accomplishment. The blisters, fatigue, chafing, chapped lips, aches and pains, and feeling so broken that they could not take another step, told one part of the story—the physical. Beyond that, though, there was the spiritual, which consisted of friendship, camaraderie, and the acknowledgement that the universe had granted them a creature beaming with love and commitment to see them through on their journey; a creature that enabled them to lose themselves at times, to forget their pain, and care for him. To them, their journey represented a connection and appreciation to the people and the world around them—a connection to all living things, and realization of the fleeting time we have on earth to experience it all—the highs, the lows, love and beauty. While David and Amy had traveled some 363.2 miles to reach this point, they understood that it was just a part of the bigger journey they were both on, and that the magic of the Caminho da Fe was not the actual miles they had covered, but the memories the miles gave them that would endure and permeate their lives evermore. While David and Amy realized their journey, now it was Lucky’s turn to begin his next chapter. By some miracle, overnight, Lucky had gained six pounds, been groomed, and was able to endure a rabies vaccine. The vet, who shared with David that it was a marvel that Lucky chose the Floridians and stayed with them, committed to helping them bring Lucky to the United States. “He deserves it,” the vet shared, and David’s wife Monica agreed that Lucky’s place was back with them in the States. 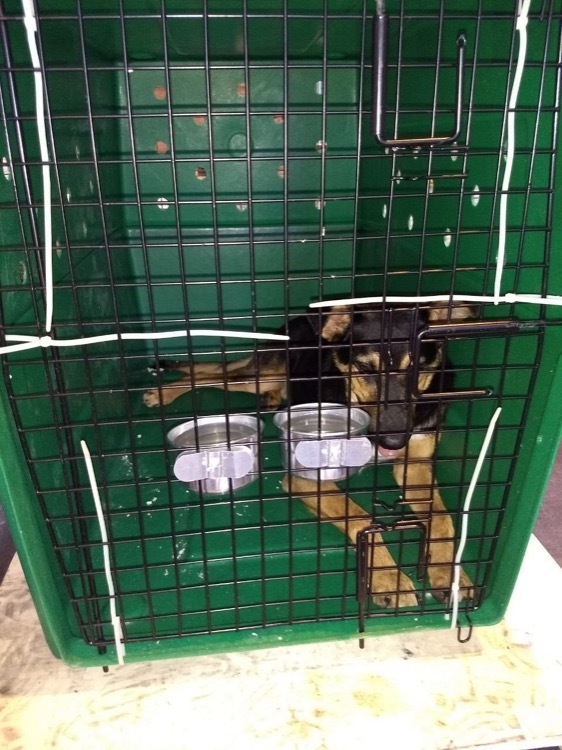 A pet logistics transporter helped them to expedite the process to transport a pet internationally, and within a few days after David and Amy returned home to the U.S., Lucky Caminho arrived in Jacksonville, Florida, where a bit unsure after his flight, he dutifully awaited his runners at the cargo terminal to continue his journey. According to David, Lucky is doing great adjusting to his new dog pack at the Green residence and is raring to go on his runs with David, Amy, and Florida friends along the roads and trails of Jacksonville, Florida. With his 148.1-mile adventure on the Caminho da Fe complete, Lucky is said to be considering his next ultra-adventure.